Overview: The Kyrgyz are a Central Asian, Turkic-speaking people whose homeland, the Republic of Kyrgyzstan, is located at the western end of the Tien Shan Mountain Range of northwestern China. Kyrgyzstan is bordered in the north by Kazakhstan and on the south by Uzbekistan and Tajikistan. 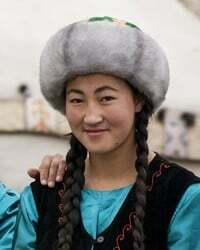 Etymology of the word "Kyrgyz" suggests they descended from forty tribes. As with other Central Asian peoples, Sunni Islam is the majority religion. -- James S. Olson, An Ethnohistorical Dictionary of the Russian and Soviet Empires. Westport, Connecticut: Greenwood Press (1994), pp. 416-423.